If there is one thing that I hate, it is lawn mowing. Perhaps I should get one of those remote control lawnmowers, like the GOAT. I know that can’t afford a riding mower, and don’t have that much of a lawn to use it with. What I wouldn’t give to have this riding scooter. 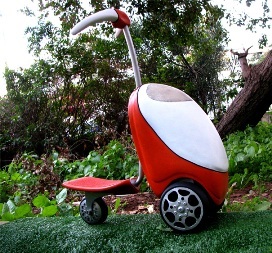 The Lawn Mower Scooter is designed by Vicky Petihovski, and I believe that it is a way of making America’s least-liked chore more fun. According to the specs, it has an electric motor that can drive the blades and scooter. That means that you can ride the scooter while the blades are doing the work. It can reach up to 6 kilometers per hour, and it can collect the cut grass inside of it. There is even a transparent window so you can see inside of it, and tell when it is time to be emptied. Speaking of empty, I don’t really see a place where the engine will sit. I also don’t see where to put the gas, assuming that it runs on liquid fuel. If you ask me, this lawnmower scooter looks like it is meant to be a toy, and it reminds me of a Radio Flyer wagon. However, would you feel comfortable giving a child a lawnmower? I mean, I would feel comfortable letting a teenager mow the lawn, but seeing Dad playing with the lawnmower scooter would definitely inspire a child of any age to want to join in the fun. Let’s see, if it has an electric motor which powers the blades and scooter, per the info given, why would one need to have an engine and fuel tank? i like this lawnmower!it’s funny.